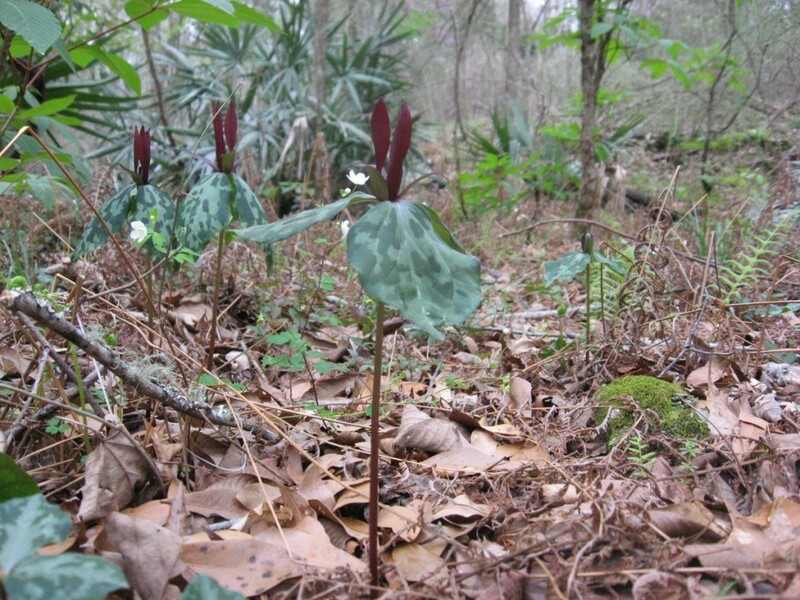 THE SANGUINE ROOT VISITS RARE AND ENDANGERED TORREYA TREE AS WELL AS THE STUNNING BEAUTIES TRILLIUM MACULATUM, TRILLIUM DECIPIENS AND TRILLIUM UNDERWOODII IN THEIR NATIVE HABITATS. 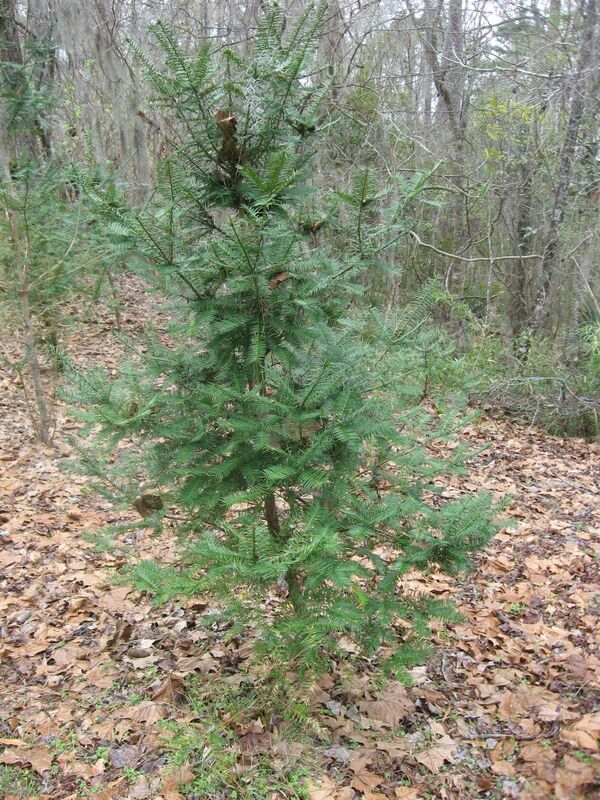 Along the limestone bluffs on the east banks of the Apalachicola River, the Federally endangered and rare Torreya taxifolia greeted us with a magnificent plaque. 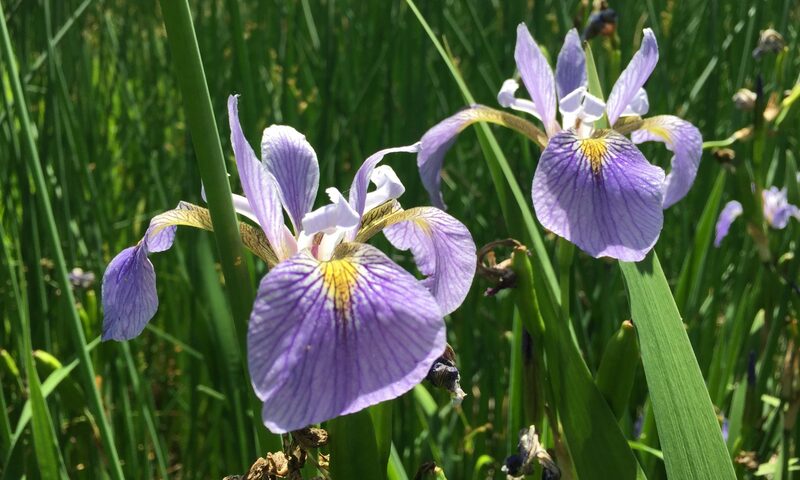 Situated on the high limestone bluffs above the beautiful Apalachicola River, this cultivated specimen welcomes visitors to the park. There was one specimen growing in the wild off in the woods behind the plaque. 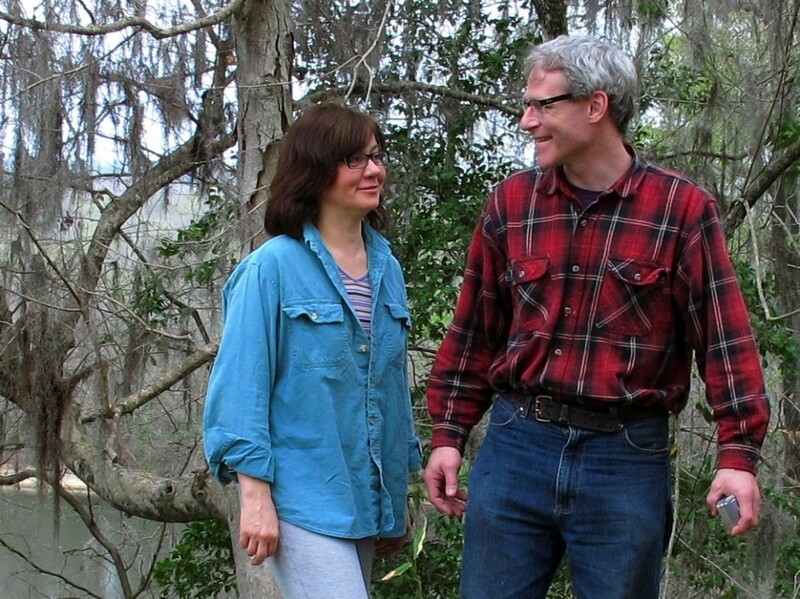 As our native Floridian hosts Mark Daniel and Cathy Smith led us down the steep and winding path of the calcareous slopes we continued to look for the rare and endangered Torreya tree but were distracted by the many other species we are not used to seeing. Among them, Needle Palm, Southern Magnolia and Oakleaf Hydrangea. 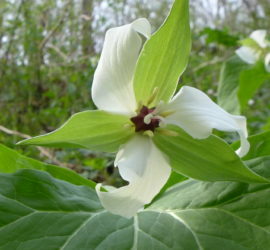 While we were marveling at the spectacle of an actual Trillium before our eyes, Isabelle spotted a piece of trash sitting right next to Trillium underwoodii! 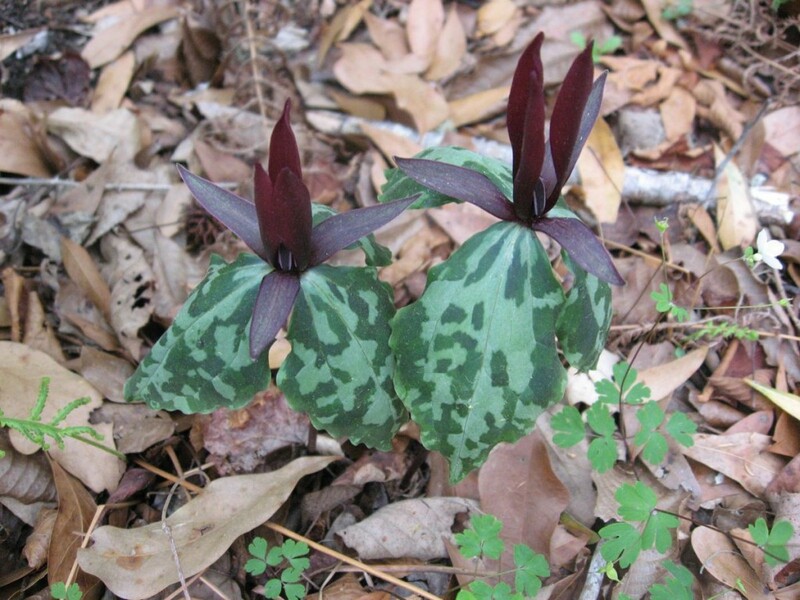 This Sessile Trillium is notable for its short stature during flowering. 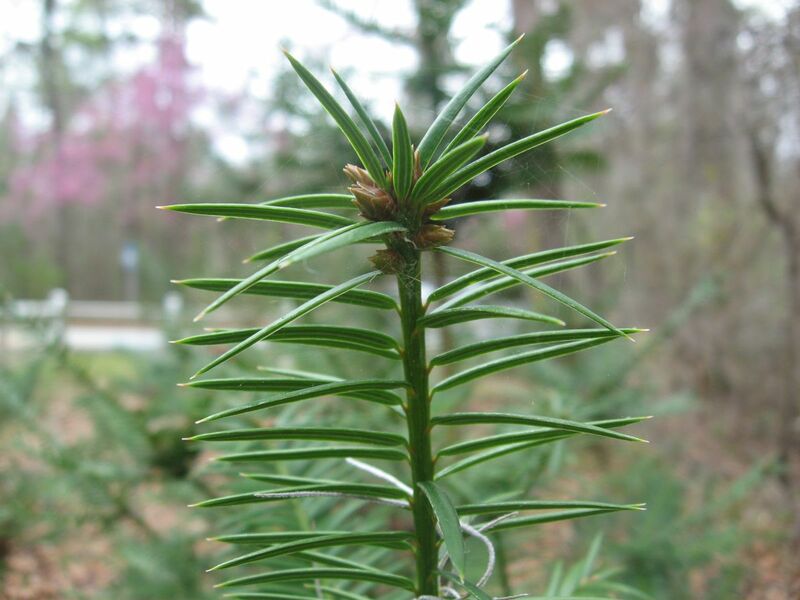 Often its mottled leaves touch the ground at their tips. 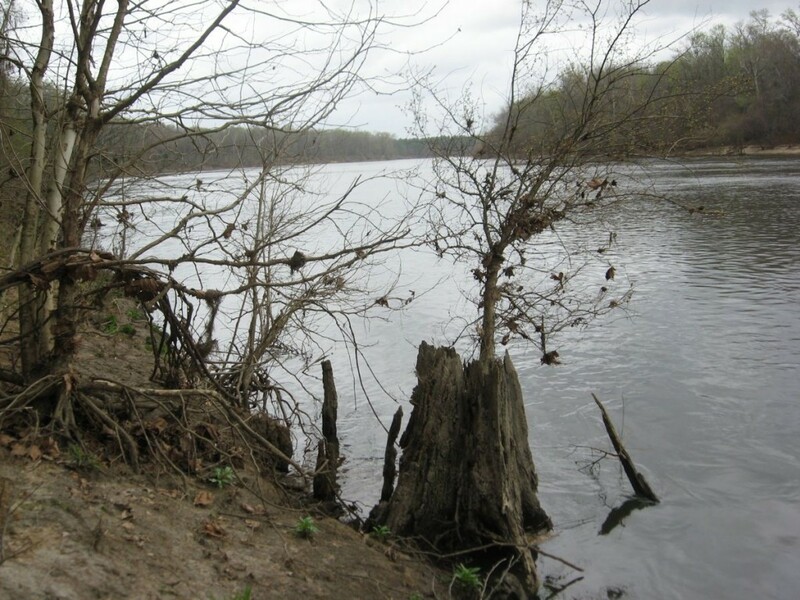 The river’s edge featured grand Sycamore trees, some of them being eroded at the roots by its constant directional flow. The Park is located on the outer edge of a curve where the water rushes against the banks, cutting into the sides and undermining the trees. On the inner side of the river’s curve, sand and silt is deposited, growing the bank’s size. 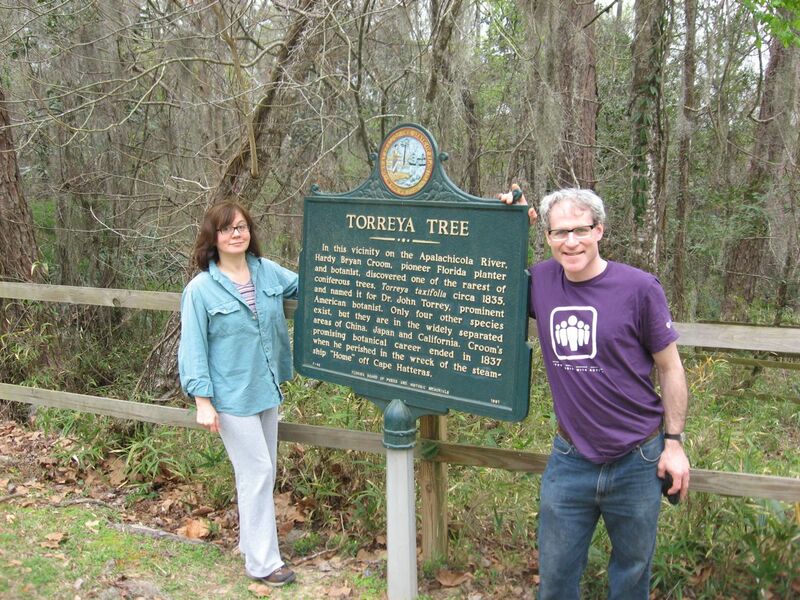 Our Local tour guide and host Mark Daniel next took us to Florida Caverns State Park in Marianna Florida. 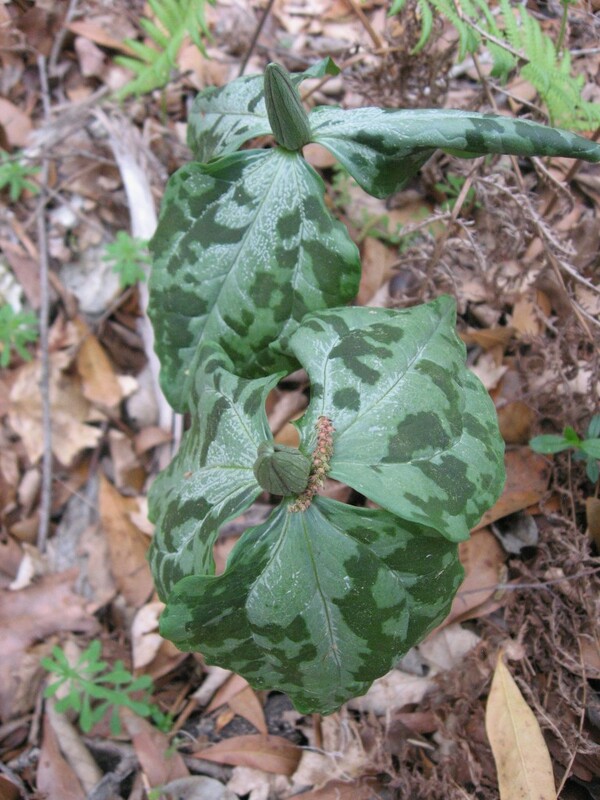 We had no idea what to expect there, however we knew that it was full of limestone bluffs and that it was within the range of at least two Trillium species. 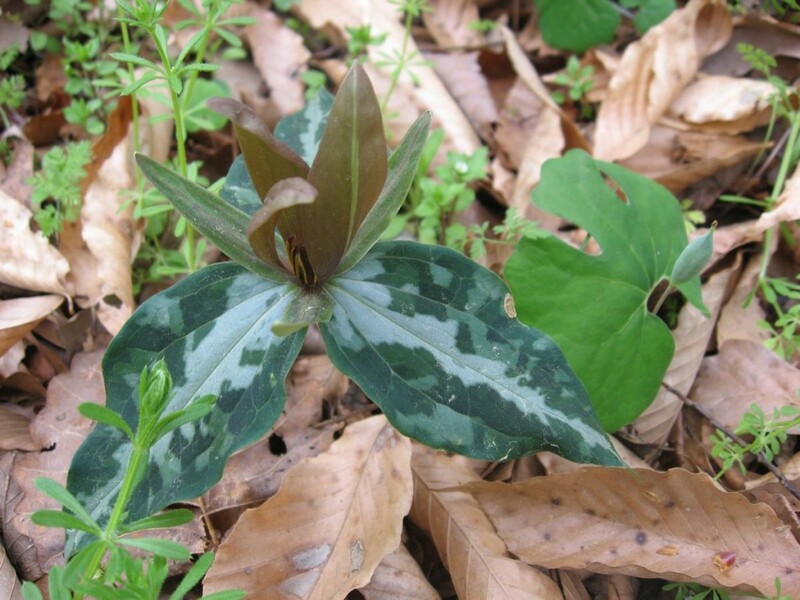 These two factors can be important in the calculation that Trilliums can be found in a target area. 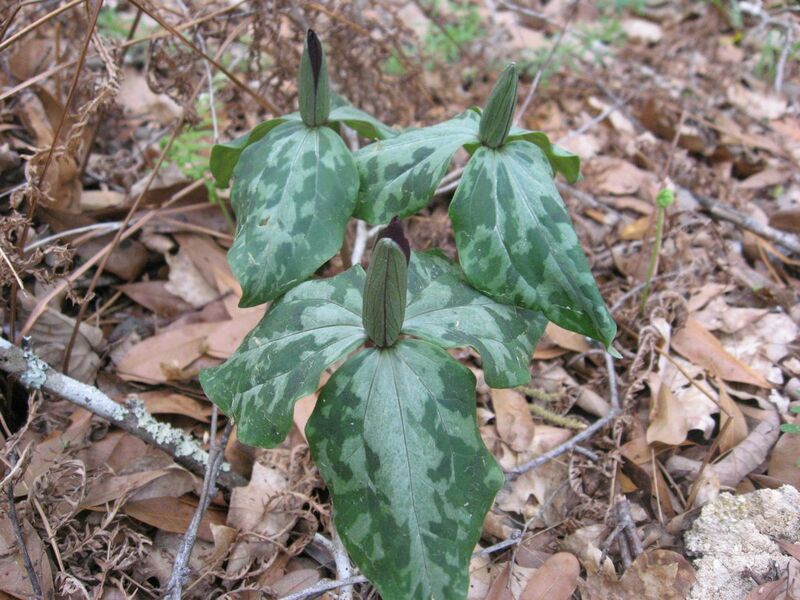 We were right on because within 50 feet of the parking lot we were greeted with a host of spring wildflowers, including three species of Trillium. 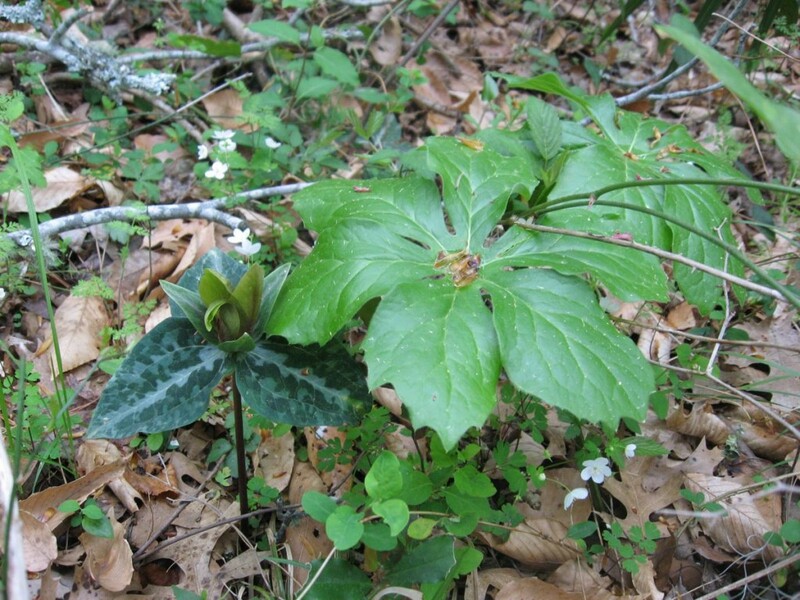 We were pleased to see False Rue anemone (which we initially confused with Rue Anenome), Bloodroot (Sanguinaria canadensis), Mayapple (Podophyllum peltatum), Blue Phlox, and Columbine. A trio of Trilliums. This is what we signed up for! 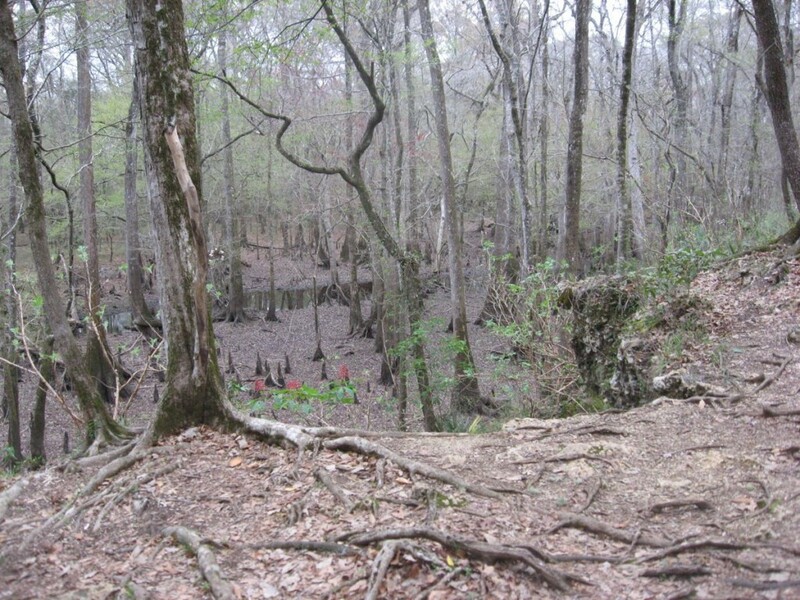 The low limestone cliffs dropped down suddenly into a broad floodplain. The limestone was soft and caverns formed below the ground. 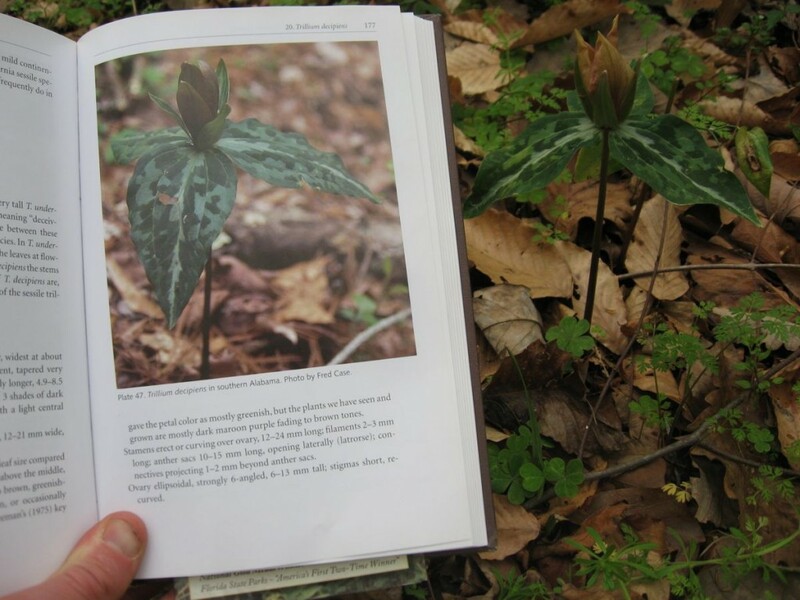 Wanting to find and then actually finding and identifying these Trilliums was made possible by the book Trilliums, by Frederick W. Case Jr. and Roberta B. Case. This book has opened up the world of Trilliums to us. Our volume comes on site wherever we go looking for Trilliums. 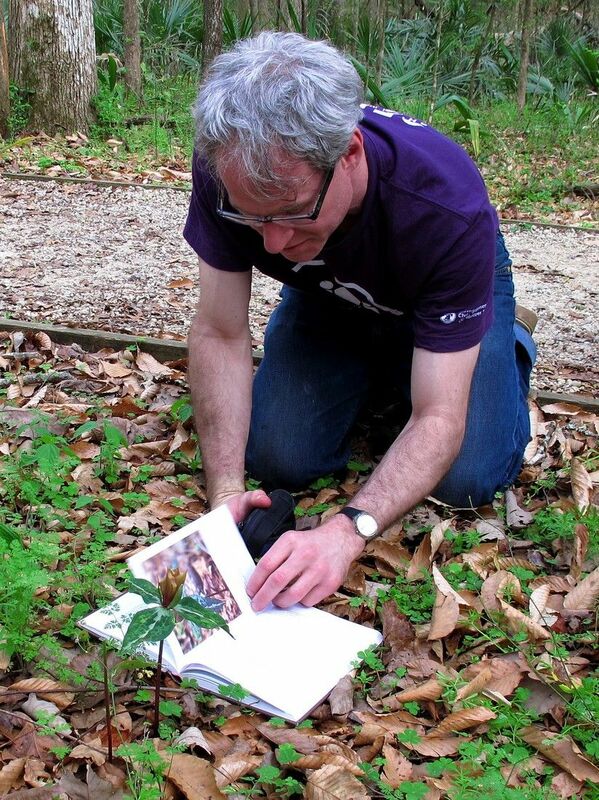 We needed to identify the three different species of Trilliums, which is easier with a botanical key on site. We found a great local website about the flowers in the area later that night. It turns out the Caverns State Park was the ticket. We did not have time to visit the caves. The flowers engaged all of our time and kept us very busy identifying and documenting. 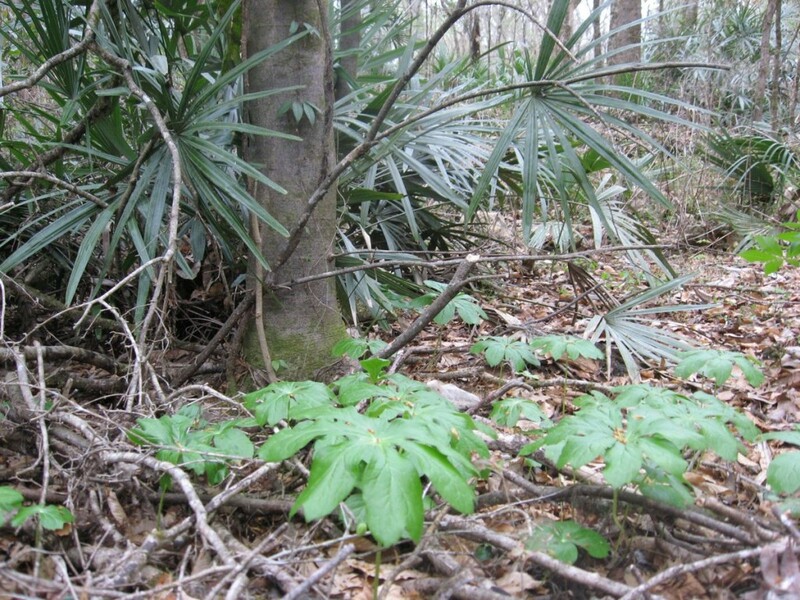 We had heard that Mayapples(Podophyllum peltatum) were rare in Florida, and were at the bottom of their range. It turns out according to this website that they only exist in the Caverns State Park and in the immediate area around it. 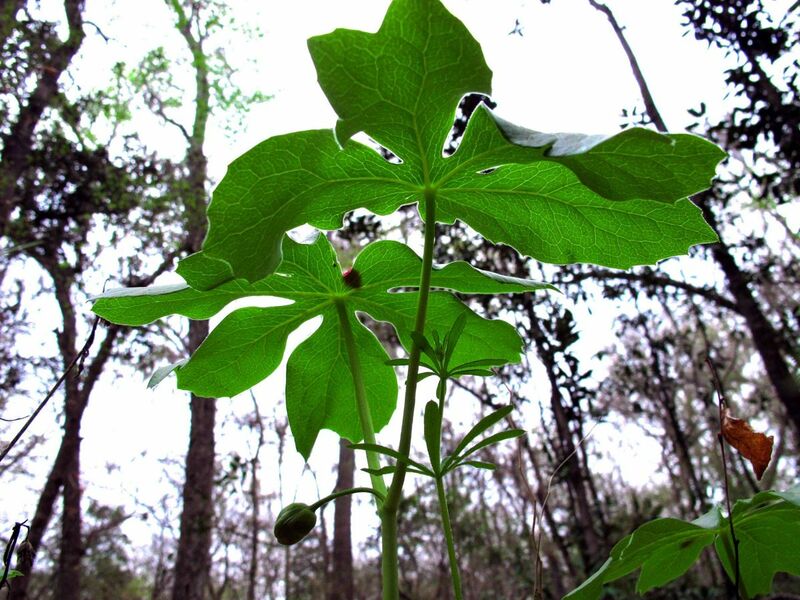 We never in our wildest imaginations expected to find Mayapples in Florida. The very bottom of its range. It cannot get better than this. Also False Rue Anenome, which was everywhere, floating gracefully above the leaf litter. 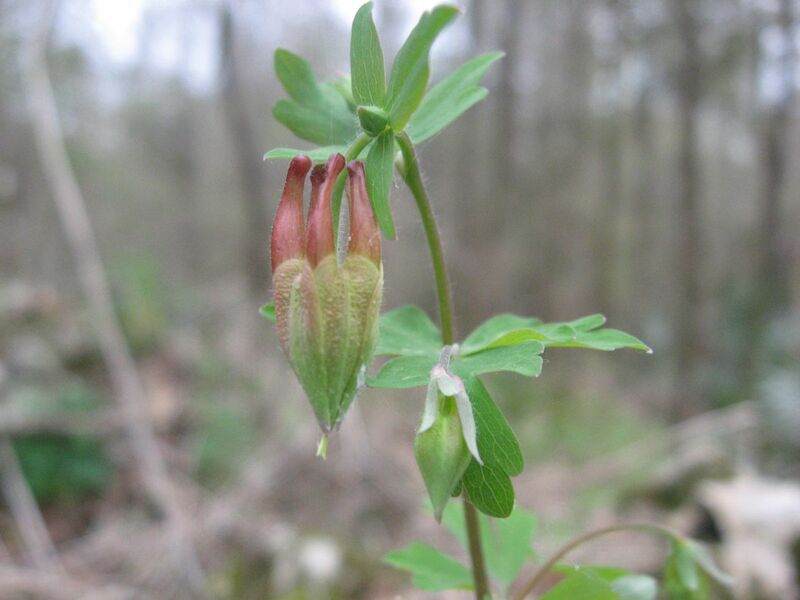 Wild columbine (Aquilegia canadensis). After spending hours with the flowers. (We wanted to photograph them all really) we climbed down the limestone bluffs to the Cypress Trees. There has been a serious drought in Florida, as can be seen in this picture. Cypress trees like wet feet. There is so much to learn from the day’s adventure. The ecosystems we encountered require so much thought and data to process, so many questions. This is what travel is about: we can compare Mayapples to Mayapples and Beeches to Beeches. Contrast a Cypress wetland to one where Skunk Cabbage grows. We were just happy to be out of the snow and cold, and not in the car staring at endless swaths of asphalt. This was one fine magical afternoon in the northern Florida panhandle! This Post was made possible with the careful tour planning of our keen local guides Mark Daniel and Cathy Smith. 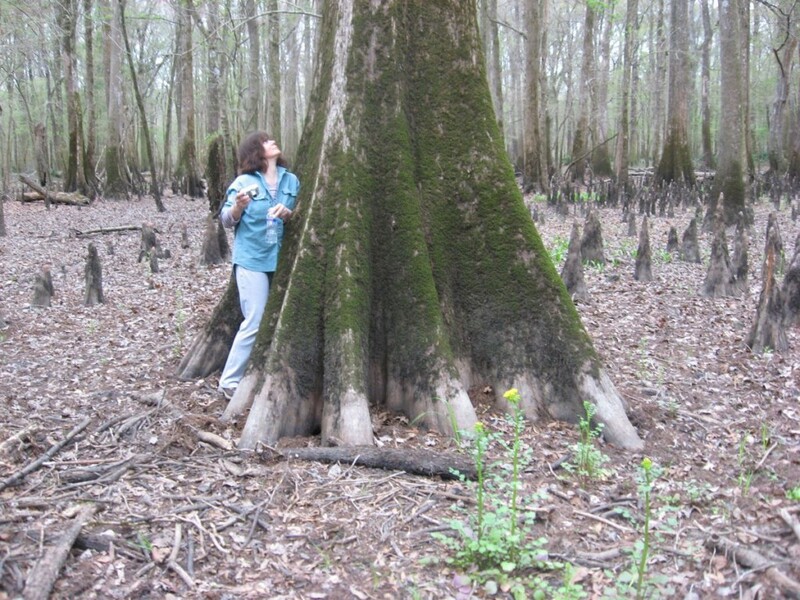 Thank you both for showing the staff of the Sanguine Root a beautiful ecosystem in Florida’s panhandle. 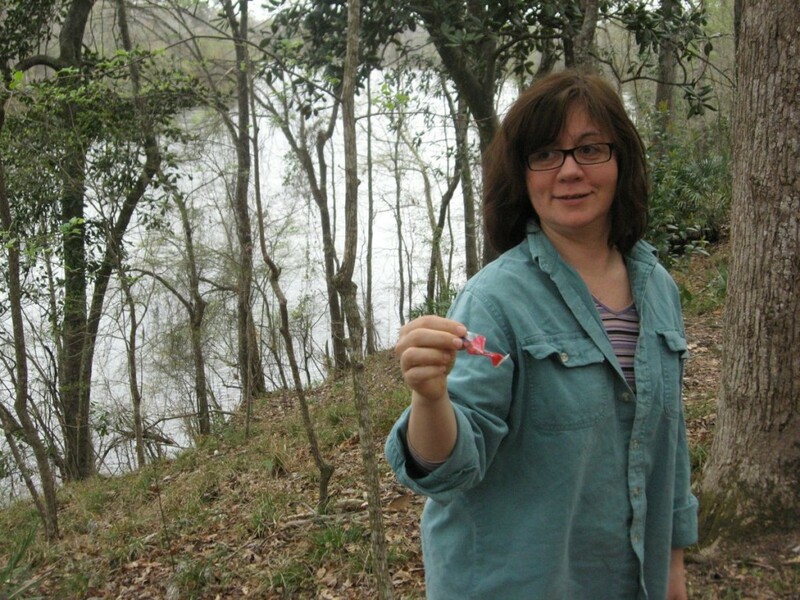 I am from marianna and familiar with the caverns plants. 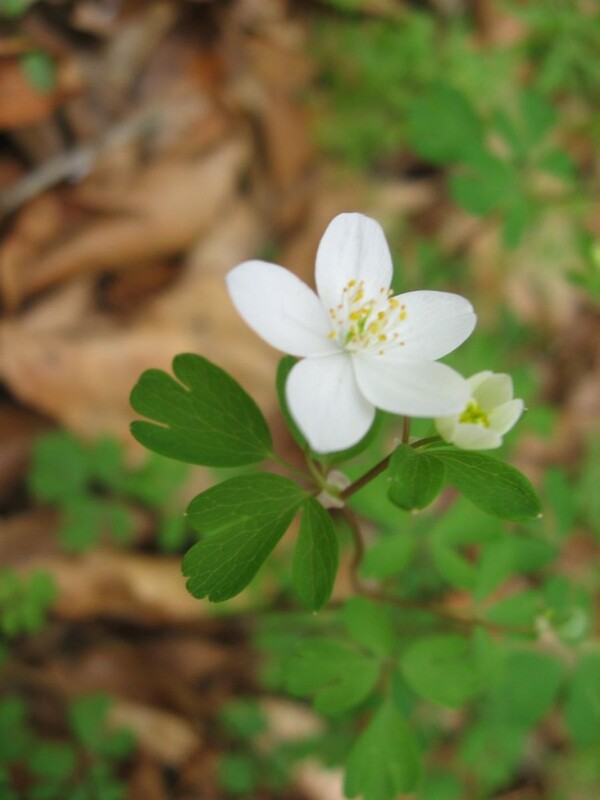 The abundant rue anemone you saw is false rue anemone – isopyrum biternatum now known as enemion biternatum, which is a very nice plant. I have heard rue anemone is there but have never seen it there. 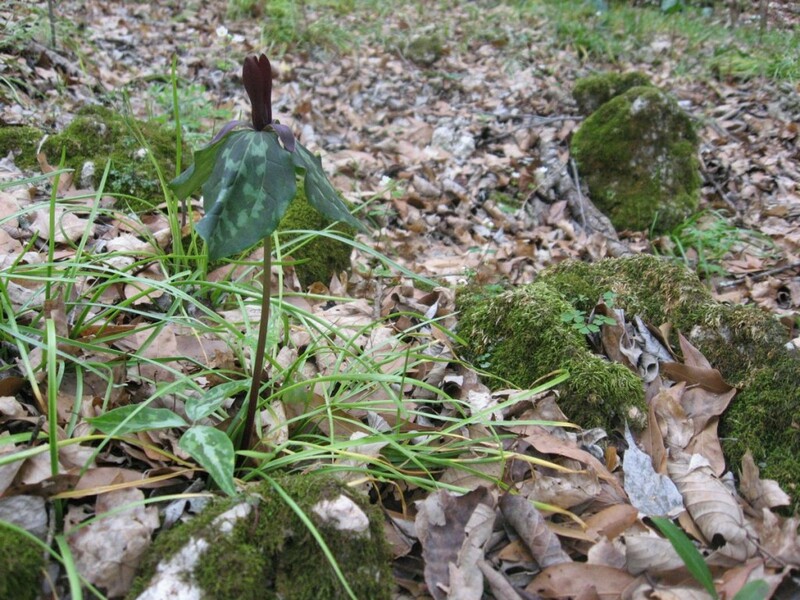 The Trillium maculatum are so beautiful – good to hear you found even more than you expected! Good pictures too! 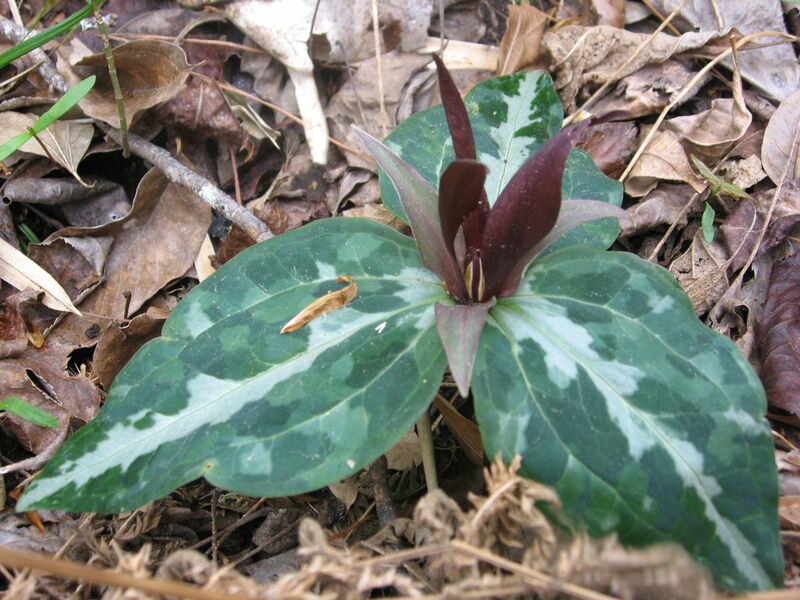 We think that the Trillium maculatum is one of the most elegant of the sessile trilliums. We love the way the leaves droop, and the brilliant maroon color of the flower petals. You folks from “The Root” will always be welcome to visit our corner of the country! It was a pleasure to learn so much from you. There is a whole lot more to see. Maybe next fall, you can drop by to watch the Monarch butterflies departing for Mexico from the shores at St. Mark’s Wildlife Refuge.